As a document of an iconic musician’s skills, the film is essential. But Amazing Grace is far more than that: Watching it is a transcendent, spine-tingling, uplifting, utterly joyous experience. As cherished as the album version has been since its release, the film is nothing short of a revelation, soaring from one chill-inducing moment to another. 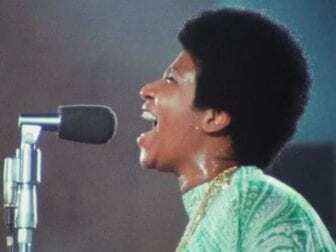 Marvin Gaye, whose “Wholy Holy” Franklin covers on Amazing Grace, told her biographer, David Ritz, that the album is “Aretha’s singular masterpiece … her greatest work.” And it’s with “Wholy Holy” that Franklin begins her performance, seated at the piano, with plushly arranged vocals from the choir backing her. It sets the reverent mood for the sessions. That sense of shared spiritual experience, a communion of believers and their God, is what defines Amazing Grace — a project recorded not in a studio, but in a living church. Moreover, Franklin is surrounded by a community that she understands innately, says Aaron Cohen, who saw the film’s raw footage about a decade ago at Elliott’s invitation. Cohen is a professor at the City Colleges of Chicago, as well as the author of a 2011 book about the album Amazing Grace. Cohen says it’s essential to understand the community in which Franklin chose to record: the Watts neighborhood of Los Angeles, which, just six and a half years earlier, had exploded in riots. The unrest — which stemmed from deep-seated anger in the community over high unemployment, poor medical care, inferior housing, bad schools and tensions with police — left 34 people dead, hundreds injured and the neighborhood devastated. “The film shows not just Aretha performing,” he says, “but also this congregation and what it was like to be in a church in Watts in the early ’70s, in the post-civil rights era, in a time when the community was redirecting its energy and deciding where to go next. I believe you can feel that,” he continues, “through the music, through what she’s singing in ‘How I Got Over'” — a song that Clara Ward’s sister claimed was inspired by a specific incident of racial bullying that the family experienced, but whose lyrics were a touchstone for many black Americans. As dramatic as the footage is, the Amazing Grace documentary was plagued by troubles from the outset. The film of the recording sessions was made at the behest of Warner Bros. (the parent company of Franklin’s label, Atlantic Records), which hired actor and director Sydney Pollack to create it. Pollack, who had recently earned his first Oscar nomination (for They Shoot Horses, Don’t They? ), was still green enough as a director to forget an essential need in the pre-digital era: clapper boards to mark the starting points of the visual and audio elements of the film, meaning that what one saw and what one heard were out of sync. The screw-up was so bad that the 20 hours of footage were deemed useless, and the film was jettisoned. Years later, a former Atlantic A&R staffer-turned-producer named Alan Elliott took up the cause of seeing the Amazing Grace film through, and by around 2010 had painstakingly matched the movie with the sound. But Franklin wouldn’t allow the documentary to be released. In 2011, she sued Elliott on the grounds of using her likeness without her permission. In 2015, she sued again to prevent the film from being screened at the Telluride Film Festival. Part of that pleasure is in seeing Franklin work alongside her colleagues; these are musicians who innately feel each other, who are able to anticipate each other’s every move. Franklin had a crack team of collaborators, including her band of stellar players (Bernard “Pretty” Purdie on drums, guitarist Cornell Dupree and bassist Chuck Rainey). The backing choir was directed by Rev. James Cleveland, who had formerly served as the minister of music at Aretha’s father’s church, New Bethel Baptist in Detroit, and was one of Franklin’s mentors and a gospel-music giant in his own right. There’s no narrative to the film, and — aside from nothing more of a glimpse of a rehearsal — no behind-the-scenes segments to make viewers feel as if they’re learning more about Franklin’s process or gaining insights into her day-to-day life. Moreover, the film captures the breathtaking force of feeling from both artists and congregants. Near the end of the song “Amazing Grace,” for which Cleveland has been accompanying Franklin on the piano, he slides off the piano bench, giving his space to Hamilton, and surrenders to shoulder-heaving sobs, rocking himself back and forth in a congregational seat. He’s not the only one — by this point, audience and performers alike are wiping tears from their faces — and when Franklin herself sinks down into a seat at the song’s conclusion, she well may be weeping, too. But her face is so sparkling with perspiration, it’s impossible to tell for sure. During that second night of recording, Franklin watches her father with shining eyes as he mounts the pulpit to wax ecstatic about her talents. After delivering remarks in his stentorian, mahogany tones, he gleefully tells the congregation, “She is a stone singer,” while she melts into a smile. But in a gesture and response intimately familiar to generations of parents and children, we also see a flicker of annoyance in the nearly 30-year-old’s fleetingly pursed lips as her father, apparently unbidden, daubs some perspiration off her face while she sings.